I understand that some houseplants can be with me for years and years while others are better for short-term pick-me-ups. As a gardener I’ve learned that when a houseplant is purchased we don’t always know if that plant will be long-lived or not. This is also OK…”Surprise me,” I say. Often the public doesn’t have such a forgiving or adventurous attitude toward their plants. They want “something I’m not going to kill.” If you’re of this mindset, I invite you to think about your flowering houseplants in the same spirit as a meal out. When you go to a restaurant you’ve never been to before there’s a chance that you won’t like the food. It might be fantastic, or it might be horrible…most likely the experience will fall somewhere in the middle of those extremes. Going out to eat is nevertheless pleasurable, not to mention somewhat of an adventure. “Surprise me,” we say, hoping to be delighted but accepting if that’s not the case. After all, it’s just one meal. Most flowering houseplants will cost a great deal less than that restaurant meal and even if you have a black thumb they’ll last a lot longer. So what’s the hesitation? After all, it’s just one plant. Go into a greenhouse this month and get your flower fix. Be willing to be surprised. This was one of the plants that caught my eye today: Kalanchoe 'Pearl Bells' - it's a good example of a "lift my spirits" houseplant because it doesn't flower continuously. 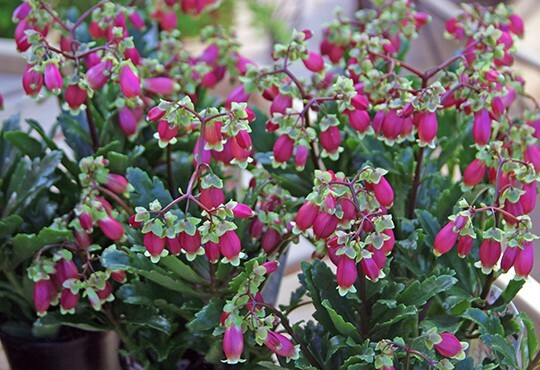 Kalanchoe is triggered into flowering by short days. This means that if I keep the plant alive and doing well all year, and I have it in a room that doesn't get supplemental lighting in the winter, it will most likely flower for me sometime in January, February or March of 2014. Or I might just thank if for making me happy this winter and toss it in the compost this spring. Choose a plant that is just coming into flower rather than one that is already in full bloom. This will provide the pleasure of seeing the buds open and give you a longer time to enjoy the flowers. The biggest reason that people have plants die early is that they either over-water or under-water the plants. First, poke a hole in any foil or decorative container the plants might be in so that excess water drains out of the pot. Place the plant on a shallow bowl or saucer to catch this drainage. Look at the plant at least every three days and feel the soil; if it looks and feels dry, water it well and let the excess water drain into the saucer below. Allow a couple of hours for the plant to absorb any of this liquid in the saucer and then pour out the rest. Wait until the soil looks and feels dry before watering again. A good soaking less often is better than a little every day. If you have a hard time remembering to check your plants and water them, set an alarm on your cell phone or in your computer’s calendar. Plants need light. If you put yours on a coffee table in the middle of the living room where there isn’t much light, it will only last for two or three weeks before starting to fail. This is longer than most bouquets of cut flowers, so don’t feel badly if the plant dies after a month in this location. But if you want to try and keep a houseplant for a longer period of time, place it near a window during the day and on the coffee table in the evening.